We spend a lot of time comparing ourselves with others but despite that we’re often not very good at it. For example, here are three comparisons that people regularly make. A new PhD student compares their first draft of a piece of writing with an article in a top journal written by three eminent professors. A person who starts a new job compares their performance with someone who has been doing it for 20 years. A person decides to take up painting and compares their first effort with the Mona Lisa. Obviously, if you compare yourself to leaders in the field, to the superstars, or just to people who have much more experience than you, then you are going to come off badly. We tend to look just at our immediate group for comparisons. 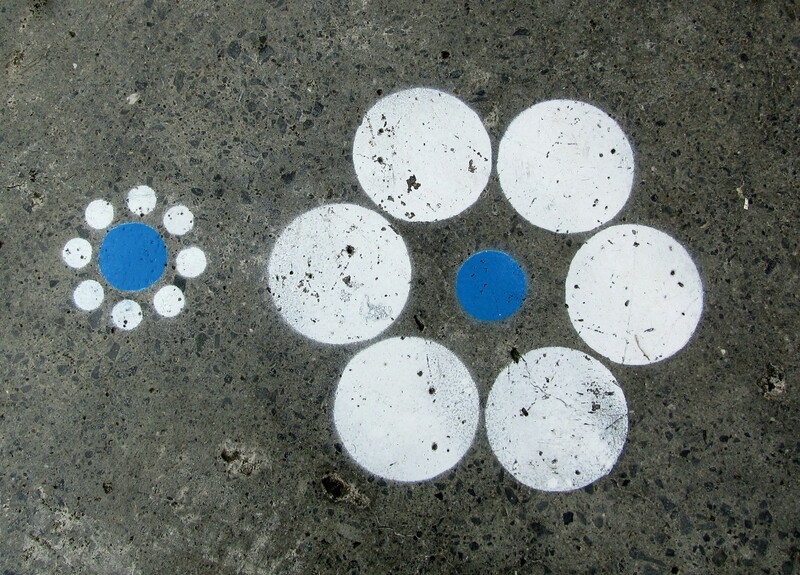 The blue circle on the left seems quite big when it is surrounded by smaller white ones. Yet the same circle seems small when surrounded by those bigger ones on the right. Both blue circles are the same but the context makes one look bigger or smaller. So if you want to look clever, hang around with stupid people. If you want to look fit, hang around with unfit people. And of course the reverse also happens. Let’s say a student has been top of their class in high school. They feel really intelligent. They go to university and now they are surrounded by lots of clever people. They don’t feel so bright any more. And then they continue hanging around with ever-more clever people. People who have a Masters degree or a PhD. They haven’t got more stupid – it just feels that way because the comparison group is smarter. We’re very selective in what we compare. We tend to compare the insides of ourselves with the outsides of others. Our insides e.g. our worries and doubts, our imposter feelings, the slight slip-ups that nobody but us notices, are compared with the competent exterior that others portray, their effortless successes and their obvious self-confidence. If you want to experience this, just read someone’s curriculum vitae. It reads like a series of inevitable successes. All the awards they’ve received, the important roles they’ve performed and the glowing references – without ever a hint of a setback or failure. And then we look at our own experiences. Jobs we didn’t get. Projects that didn’t turn out well. Qualifications we don’t have. In April 2016, Johannes Haushofer, an Assistant Professor at Princeton University published his CV of failures to highlight the distorted view we get when reading other people’s CVs. Social media tends to amplify this. When we look at other people’s profiles all we see are the highlights, what seems like a series of peak experiences. While in our own lives we are well aware of the many valleys. So it looks like everyone else is having a great time while we are just wasting time. Get a ruler and measure those blue circles. Use an objective standard. Stop comparing your insides to other people’s outsides. 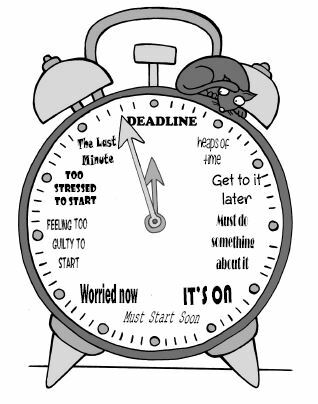 We all procrastinate occasionally (well, quite often actually) – we put off writing the assignment, we avoid making that difficult phone call, we do the housework instead of paying the bills. That’s pretty normal. But some people use it as a self-sabotaging strategy. Here’s how it works. You might have to do a test in a month’s time. It’s a bit scary. You might fail. They will find out that you don’t really know your stuff. So you put off preparing for the test. You find other more important things to do like rename all the folders on your computer, clean out your wardrobe, visit the in-laws, even a dentist’s appointment looks good. You leave your preparation to the very last minute. Then, because your anxiety is now really high you cram all night before the test. But the procrastination has given you your alibi. If you don’t do well you can say “Well what can you expect. I only started on it last night. If I had more time I would have done better”. And if you do well then you feel good because you can say “Look at that. Even though I only had a short time I still did well.” You win either way. If you had started preparing a month ago and worked hard and then you didn’t do well – that would be really bad. Clearly then you must be a fraud. You’ve given your best effort and it wasn’t enough. Game over. And so procrastination allows you to protect yourself from being exposed. You now have a valid excuse. An alibi. This is where you set high standards for yourself. But not just high standards – stratospheric standards. The presentation can’t be just good. It has to be the best presentation in the conference. Or that novel you’re planning to write – you don’t want to write any old rubbish. This is your chance to write the next Harry Potter. So since you don’t have much time right now, or don’t have the perfect idea or perfect opening sentence then there’s no point in starting. Let’s wait until you can do it properly. Until you can do it justice. Which sounds plausible. Worthy even. And it would be OK if you did get on and do it but often the right time never comes, the killer opening sentence never materialises and so the novel remains a work of fiction – in your head. But you have a good excuse. “I know I didn’t get it done. But I’m not procrastinating or avoiding. I just want it to be as good as it can be”. Accept that you will feel anxious and uncomfortable. And that this is normal, not nice but normal. Remind yourself that a mistake is not fatal. Unpleasant, yes, but it does not mean that you are stupid or incapable or a failure. Be objective about the scale of the mistake. Is it as bad as you think? What was the context? Could you have done anything about it? Does this mistake wipe out the positive parts of what you did? How significant will this be in a year’s time? It can be hard to be objective by yourself so perhaps you need a second opinion. What are the consequences? How likely are the negative consequences? Then try to take some action rather than dwell on the worries. What can you do to rectify the mistake? What can you do to move on? We all make mistakes. It’s not nice and you will probably feel embarrassed and uncomfortable. That’s normal. But a mistake does not mean you are a fraud or a failure. And if you have a strategy for dealing with mistakes you can keep your response in perspective. Extract from The Imposter Syndrome. Hugh Kearns, 2015. What do you expect of yourself? What do others expect of you? What do you expect of others? Through this tangle of expectations we form our view of ourselves and the world around us. And if you don’t meet these expectations? Well maybe you’re an imposter. Getting overpraised can lead to unrealistic expectations. 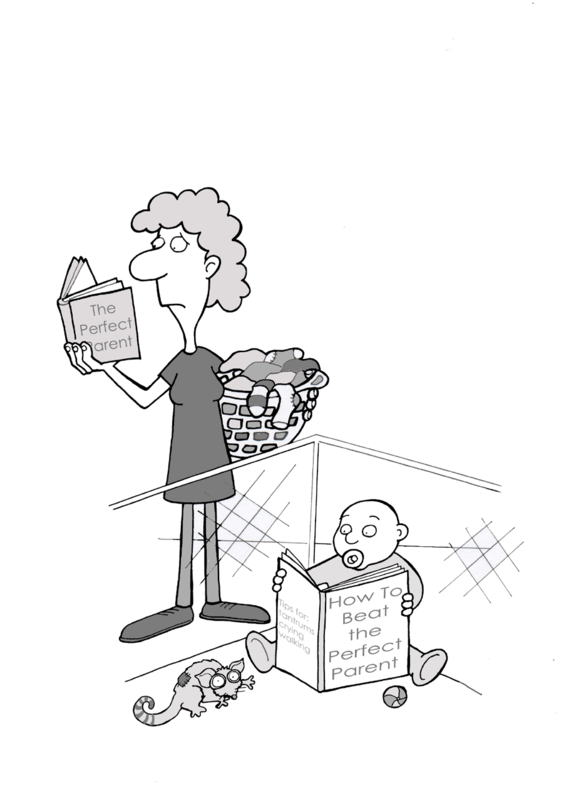 For example, a child does well at school and the parents say “Oh, Johnny, well done. You’re so clever. You can achieve anything. You’ll go far”. Suddenly, the expectations on Johnny have risen. Now his one good result has turned into a lifelong expectation of doing great things—top of the class, scholarship, university medal, the Nobel Prize. And Johnny’s not so sure that he can match up to this. Inside, he knows he’s just Johnny, but somehow he’s tricked them into thinking he’s a genius. Especially as the praise has focused on an ability, i.e. cleverness, rather than his effort. Some people have always been told that they are no good, that they will amount to nothing. People in our family, or people like us don’t get a good job, don’t get promoted, don’t go to university. So even when they do get a good job or go to university, there is the lurking fear that there is something wrong with this, that they don’t belong. Or that the success they achieved must be due to some external factor like luck, timing or patronage, because it couldn’t be due to the person themselves— because people like us don’t get a good job or go to university. As we’ve seen, the imposter syndrome is about the feeling of being exposed as a fraud, of failing to live up to some expectations. The idea of failing is so horrible that it is almost unbearable. For some people, failure is the ultimate shame. They do not recognise that failure is a normal part of life and that to achieve a lot you also have to have failures along the way. For some people the fear of success leads to imposter feelings. What if I do well? The expectations will be raised the next time. They will expect this level from me all the time. These fears, of failure and success, are based around the expectations of others, about not meeting expectations and then being uncovered. One of the characteristics of the imposter syndrome is unrealistic expectations. Some people have a tendency to set extreme expectations for themselves. 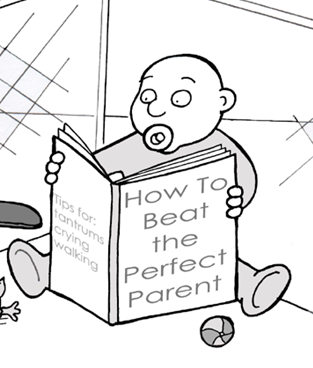 For example, it’s not good enough to do well on a test, you have to do the best on the test. It’s not good enough to give a good presentation, you have to win the award for the best presentation. Many studies have found correlations between perfectionistic thinking and the imposter syndrome. 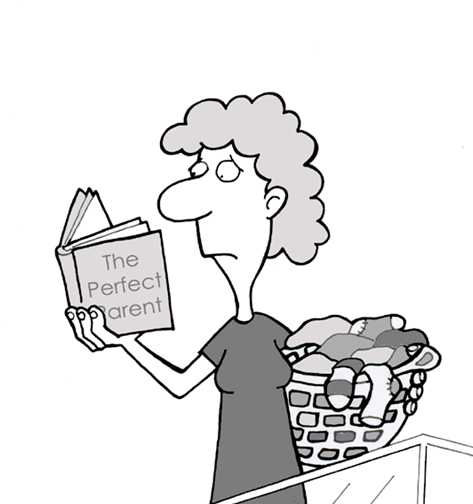 The problem with this approach is that very few things in life are perfect. This means that you are constantly falling short of this standard, and this can lead to imposter feelings. You will always be prone to being exposed as less than perfect. Extract from The Imposter Syndrome, Hugh Kearns, 2015. “ I can clearly remember my first day at university. It was terrifying. I was a mature student. As my kids got older I went back to high school and did well. The teachers suggested that I should go to university to study sociology. No one in my family had ever been to university so I had no idea what to expect. And suddenly I went from being top of the class in high school to feeling like I knew nothing. You’d imagine you’d feel clever if you’d been accepted into university. However, many people’s first experience when they get there is to feel stupid. While you might have been the high achiever in your high school, you’re now surrounded by really smart people. You feel “I shouldn’t be here. Maybe I’m not that clever after all. Maybe this is where I’ve reached my limit.” And the academic culture in universities can be very critical. When you hand up a piece of work it’s likely to come back covered in red ink. There will be lots of criticism and often not much positive feedback. And of course this critical environment fosters self-doubt. You’d assume that as you go higher, your confidence would develop and you’d lose that sense of being a fraud. After all, you have the evidence of how well you are going. But ironically it can get worse! In fact, the more you achieve the higher the standard becomes. More to prove. More to lose. You’re just one step closer to the ultimate exposure. During a lecture I gave at Harvard University, one student described the experience of starting there. She said she and her classmates were all in the top 10% of their high schools. They were used to being told how clever they were. They were used to being top of the class. However, in their first week at Harvard, 90% of these students have to adjust to not being in the top 10% any more. That can be a very hard adjustment to make. If you’ve created your self-image as being the best, and you can no longer be the best, then this is fertile ground for developing a good imposter syndrome. Maybe you shouldn’t be there at all. 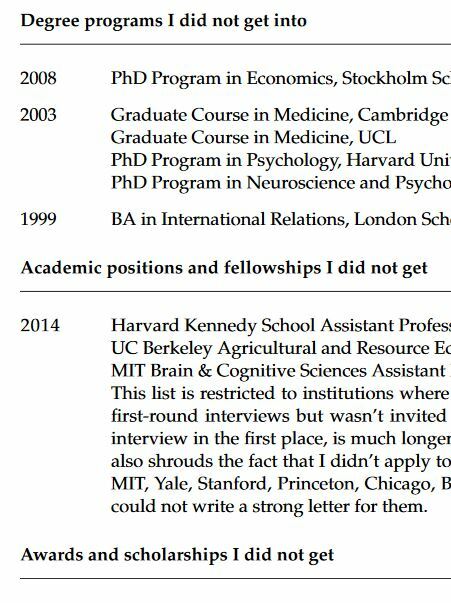 On 23 April 2016, Johannes Haushofer, an Assistant Professor of Psychology and Public Affairs at Princeton University in the US, used twitter to release a CV of failures. He did this because he noticed that in our CVs we highlight all the achievements and air-brush out all the jobs we didn’t get, the papers that got rejected, the projects that didn’t work out. Which means that when we look at other people’s CVs, or lives, we get a distorted view. We assume that they’ve had a perfect run, that everything has just worked out without any setbacks or failures. And this is a problem. Because we are very aware of our own failures. They were painful and so they are etched in our memories. So we have this contrast. We see others who look as though they have achieved great success without effort or failures. And we see our own failures and mistakes writ large. Clearly if we want to appear successful we need to hide these failures. Make sure people don’t find out about them. Because if they do find out then they will realise that you are a fraud – an imposter. The imposter syndrome. Which is why it is so helpful that Johannes Haushofer has had the courage to list his CV of failures. Here is the introduction to his CV, the link to the full CV and a discussion piece about it. Most of what I try fails, but these failures are often invisible, while the successes are visible. I have noticed that this sometimes gives others the impression that most things work out for me. As a result, they are more likely to attribute their own failures to themselves, rather than the fact that the world is stochastic, applications are crapshoots, and selection committees and referees have bad days. This CV of Failures is an attempt to balance the record and provide some perspective. This idea is not mine, but due to a wonderful article in Nature by Melanie I. Stefan, who is a Lecturer in the School of Biomedical Sciences at the University of Edinburgh. Fake it til you make it. Really? I was talking about the imposter syndrome to a group at Victoria University in Wellington, New Zealand recently. One of the questions that came up was should you fake it till you make it? Now while it’s a catc hy phrase I’ve always had trouble with fake it til you make it. I have two problems with it. The first is the word fake. This phrase is giving people permission to be fake. It’s saying go out there and be a fake. Pretend you are something that you are not. Surely there are enough conmen and frauds in the world without encouraging more. Do you want to go to a doctor who is faking it till she makes it? Do you want to get on a plane with a pilot who appears very confident but has no flying ability? Do you want to hire a new staff member who has faked their CV while they wait to make it? Faking has bad connotations for me and so I find it hard to use the phrase. And the second issue with the phrase is til you make it. This implies that after a certain period of faking you will make it. But my experience of working with people is that you don’t make it. Once you fake your way through this challenge the bar just gets higher. You tell yourself “I fooled them this time, but now they’re going to expect me to do this well every time. Or worse, they’ll expect me to do even better the next time”. And since you’re not that sure that you can meet this standard you need to fake more. 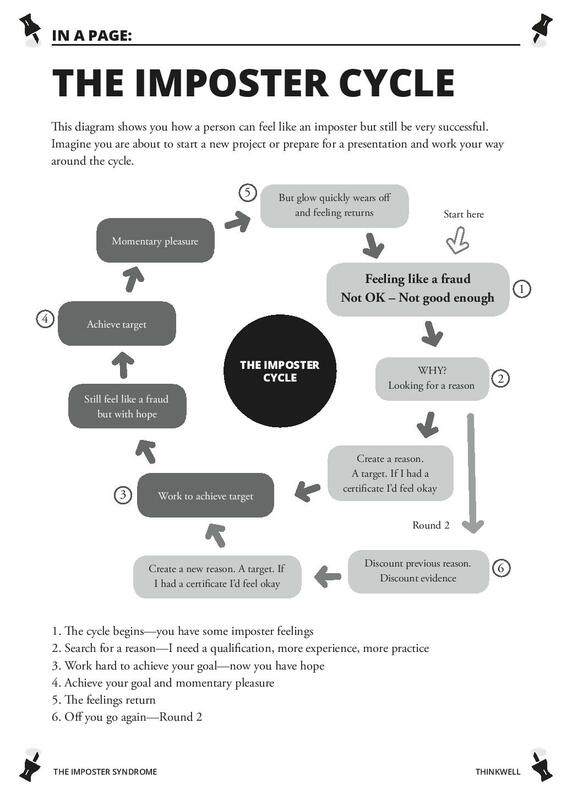 In fact it becomes a cycle, – the imposter cycle. If you want to be a brain surgeon or a pilot or a plumber faking it til you make it is not a great strategy. You can’t fake skills you don’t have. If the job or task you are undertaking requires specific skills then go off and learn those skills. But what if you do have the knowledge or skills but you still doubt yourself? Well, welcome to the imposter syndrome. This is where you have evidence that you can do something but you still doubt. 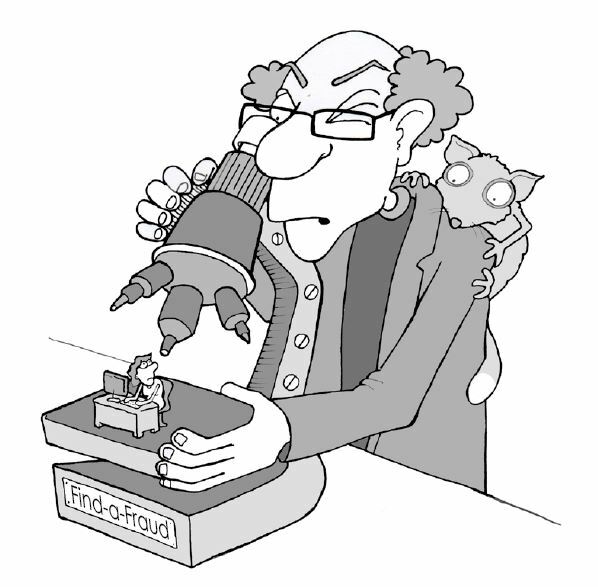 You feel like a fraud – a fake – but you are not. And this is where you need to push through the doubts and do it anyway. Not faking anything – but trusting yourself. And so the phrase I like is Be brave and take action. You’re not faking it. You do have skills and abilities. Of course you will have doubts. But you don’t have to know everything. You can learn and grow. So if your doubts and worries are holding you back be brave and take action. 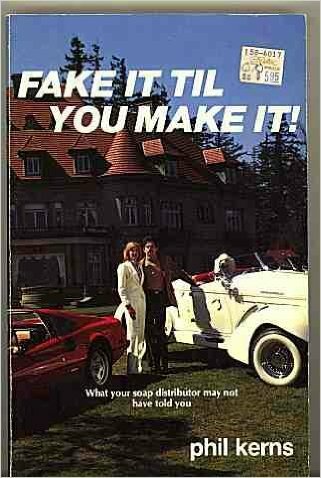 The phrase, Fake it til you make it has an interesting history. It was, and is, used by the Amway corporation. In fact, it became the title of a book written by Phil Kerns in 1982 where he described some of the techniques used in Amway. Fake it til you make it. Phil Kerns, Victory Press; 1St Edition edition (1982). It is also popular in Alcoholics Anonymous groups although it is not part of their official approach. And, of course, it is used endlessly in business, sales and the self-improvement industry. The new academic year has just started in Australia and thousands of people are turning up at university for the first time. And I can guarantee many of them are having imposter feelings right now. 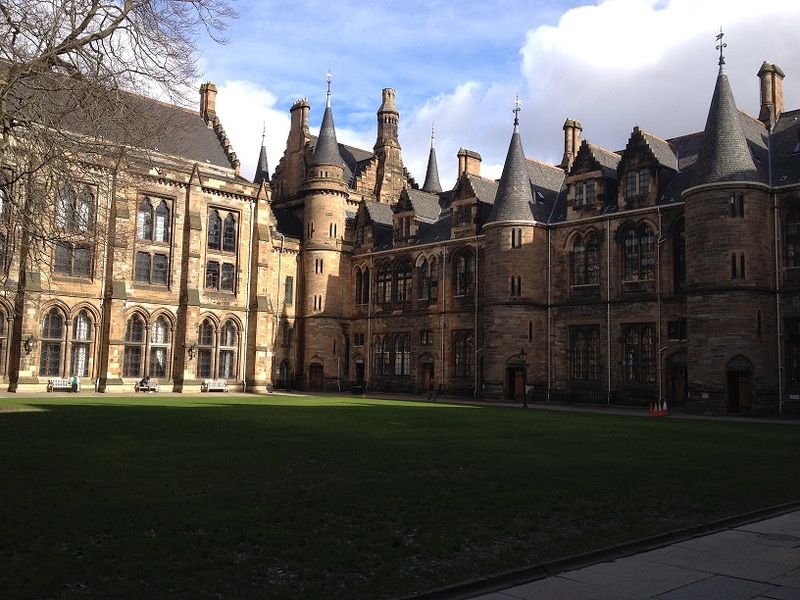 The beautiful buildings at the University of Glasgow where I visited recently. And the academic culture in universities can be very critical. When you hand up a piece of work it’s likely to come back covered in red ink. There will be lots of criticism and often not much positive feedback. 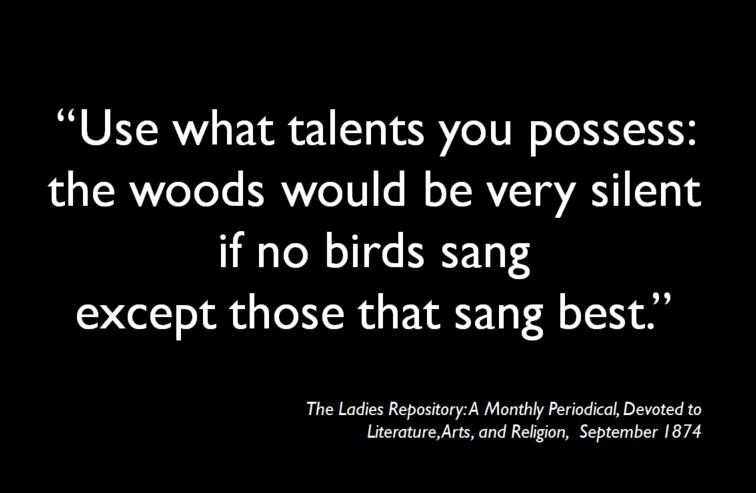 And of course this critical environment fosters self-doubt. You’d assume that as you go higher, your confidence would develop and you’d lose that sense of being a fraud. After all, you have the evidence of how well you are going. But ironically it can get worse! In fact, the more you achieve the higher the standard becomes. More to prove. More to lose. You’re just one step closer to the ultimate exposure. Here’s one person’s story, Claire, a mature-aged university student. 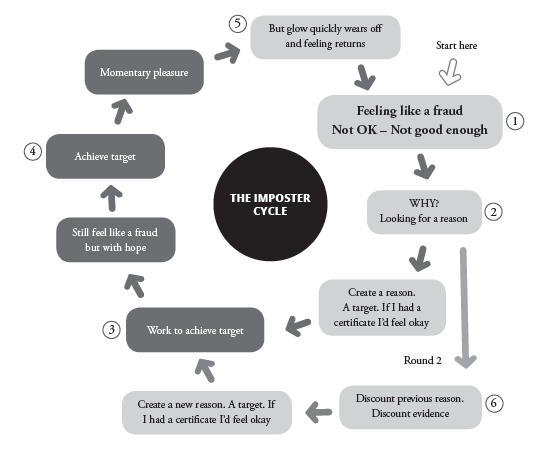 The diagram below shows you how a person can feel like an imposter but still be very successful. Imagine you are about to start a new project or prepare for a presentation. Start at number 1 and work your way around the cycle. 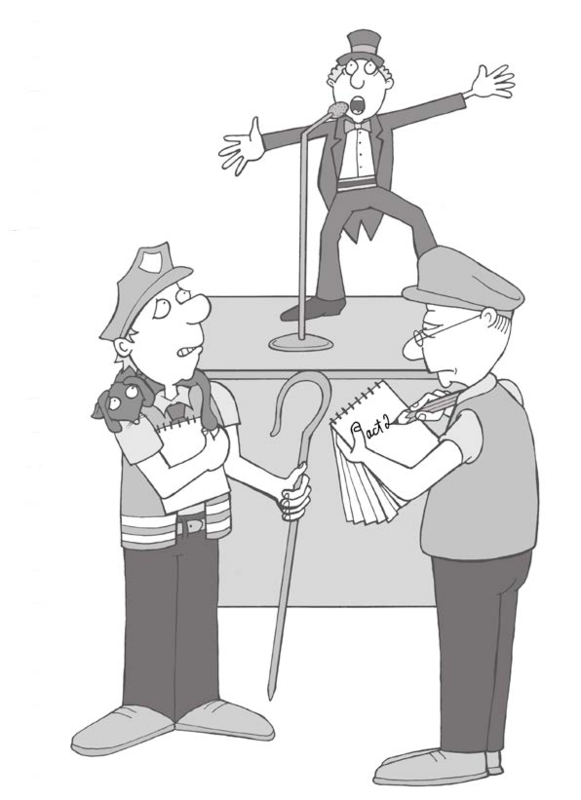 So no matter what evidence you gather you can still feel like an imposter. This is how people can be very successful and still feel like frauds.